2010 Melon de Bourgogne McSparkler—$28 2016 Newport Seafood and Wine Gold Medal, just FOUR cases left! 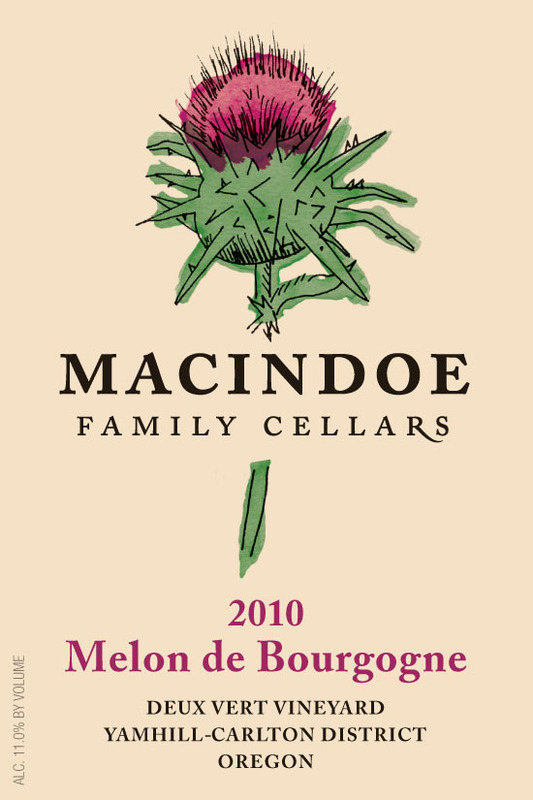 2012 Melon de Bourgogne—$18 Deux Vert Vineyard, Yamhill-Carlton District. The 2012 growing season in the northern Willamette Valley was absolutely stunning, and our 2012 Melon de Bourgogne embodies and expresses the inherent beauty of this harvest. The delicate citrus aroma and flavors were allowed to fully develop, resulting in an exquisitely balanced, light, refreshing wine of elegant dimensions. Drink our Melon on its own with a warm summer breeze, or thoroughly enjoy it with succulent Dungeness crab, grilled halibut, oysters, or seared chicken. Serve chilled. 2013 Melon de Bourgogne—$18 Deux Vert Vineyard, Yamhill-Carlton District. The Macindoes love their seafood and especially the magnificent Dungeness crab of the Pacific Northwest. Oysters may be a close second…or maybe scallops. In any event, we made a wine to match all of the above as a delightful wine to enjoy on a warm summer day all by itself. Our 2013 Melon displays the characteristics of the beautiful Loire classic, including bright citrus aromatics and refreshing minerality on the palate. Serve chilled. 2014 Thistle Wine, White Table Wine—$15 Beautifully crafted from Washington state grapes, our white table wine offers aromas of lush tropical fruit and green apple, with luscious flavors of coconut, pineapple and grapefruit. It finishes clean and refreshing. Serve chilled. 2014 Pinot Gris—$18, only 25 cases. There is a reason Pinot Gris is the flagship of white wines in Oregon. The soils and climate are ideally suited for this delightful varietal. Our 2014 exhibits the classic melon and pear aromatics, while the palate reveals beautiful tropical fruits. It finishes clean refreshing. Serve chilled. 2015 Pinot Gris—$18 The beautiful Oregon vintage of 2015 produced lush, ripe fruit with stunning complexity. Our Pinot Gris offers vivid aromas of tropical fruit, apple and pear. Lovely flavors of lemon and pear are revealed on the palate, leading to a lengthy fruit-filled finish. Serve chilled. 2013 Zinfandel—$30, only 10 cases. We added another elegant red to our family of wines. Our Zinfandel hails from Washington State and exudes beautiful Zin aromas of blackberries and black plums. This leads to a fresh black-fruit flavor with a pleasing core of acidity and silky tannins. Did we hear roast pork? 2014 Willamette Valley Pinot Noir—$28, only 20 cases of this exceptional wine. The 2014 vintage in Oregon may be remembered as the vintage of a lifetime. From bud break through harvest, the Willamette Valley experienced an almost ideal growing season. Harvest conditions allowed us to bring in the fruit with near perfect sugar levels, stunning bright fruit flavors, and a brilliant core of acidity. Aromatics reveal red cherry and plum characteristics; while the palate exudes delightful notes of blackberry and currant. Smooth tannins are evident on the elegant, lengthy finish. 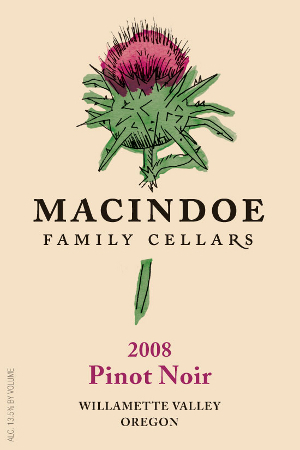 2013 Sweet Coral Pinot Noir Dessert Wine—$22 a festival favorite. The Pinot noir grapes for our 2013 sweet wine were harvested when the flavors, acids and sugars were beautifully balanced. Now in bottle, this luscious wine shows the classic, elegant nuances of Pinot noir surrounding an ambrosial core of pineapple and honeyed nectar. Serve chilled.